We may be a mere couple of months into 2015, but what a year it's shaping up to be for great music. 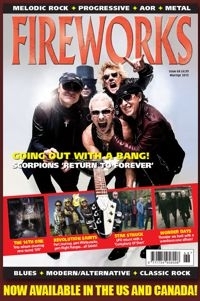 Fireworks #68 celebrates that with a host of features on a host of great albums, from revered veterans to not new acts. A legendary German act, Scorpions return with a brand new record which shows everyone retirement is not all it's cracked up to be, while one of Britain's most beloved bands, Thunder, return with their first new album since 2008. Toto turn back the clock and put out what many are calling their best album in years, while fellow survivors UFO are back with a new record of their own. On top of that, there's Revolution Saints - a new trio consisting of former Whitesnake guitarist Doug Aldrich, Night Ranger bass player Jack Blades and Journey drummer (and killer vocalist) Deen Castronovo. Meanwhile Jeff Scott Soto reveals his thoughts about returning to his metal roots, and that's just a few of the 35 interviews in the issue. To top it off, there's ELEVEN (yes, ELEVEN) interviews, on our gorgeous website Rocktopia that we couldn't even fit into the magazine, so those are online, for you to read, for FREE. With all the usual in depth reviews of new releases, reissues, live concerts, EPs and books, Fireworks gives you everything you needs to know about what's good. It doesn't matter if you like Classic Rock, Prog, Metal, Melodic Rock, AOR, Southern Rock, Modern & Alternative Rock or Blues... if it's Rock and you like it, we cover it!